mittee, which develops the U.S. po- sition on issues before the IMO. The report also concluded that further development of a substantial IMO advocacy effort must be balanced against competing priorities within the industry. Still reeling from media and pub- lic outcry stemming from the Valdez spill, many legislators have been driven to propose short-sighted and potentially damaging measures, which are all too characteristic of the political motivations existing in a period preceding an election. The industry has been faced with an onslaught of such measures regard- ing personnel, pilot qualifications, and vessel navigation equipment requirements. These bills would es- sentially breach OPA 90 require- ments for the completion of Con- gressionally mandated studies and, consequently, AWO opposes their passage and upholds the law's com- mitment to a comprehensive review of the issues. Despite the onerous oil spill li- ability provisions in OPA 90, the lack of federal preemption of state oil pollution laws encouraged many individual states to develop statuto- rily strict environmental protection measures that surpass federal regu- lations in areas such as unlimited natural resource damages, civil and criminal penalties, and financial responsibility. Marine transporta- tion of petroleum products and chemicals was temporarily inter- rupted in 1991 in Florida waters as a result of state legislation prohibit- ing the acceptance of federal certifi- cates of financial responsibility, un- til the industry was successful in getting the provision repealed to allow the federal certificate as ac- ceptable evidence. Congress continued the controver- sial debate on wetlands regulation, the industry pushed for a balance between preservation and economic activity. These legislative and regulatory initiatives produce unprecedented challenges for the association. As the government relentlessly at- tempts to increase its regulatory impact on the barge and towing in- dustry, AWO has developed a con- temporary approach to advocacy which will ensure the added visibil- ity and access necessary to assure continued viable and safe marine transportation. The repercussions of the Oil Pol- lution Act of 1990 have been felt by the entire marine industry, but no where more acutely then in U.S. inland waterway and coastal trans- port operations. Unlimited liabil- ity, escalating carrier insurance, and mandated equipment modifications are just part of the onus of OPA that operators must bear. To more fully assess the impact OPA 90 has had and will have on future inland and coastal water transportation opera- tions, MARITIME REPORTER con- ducted interviews with some of the largest and most influential opera- tors in the brown water market. Oil Pollution Act, the Clean Air Act and the near term future of the in- dustry. Emotion.' A law irrespective of dif- fering regional product and trans- portation characteristics." Pacific Northwest. The company barges clean or refined petroleum products along a short—465 miles— inland river, making their opera- tions extremely sensitive to cost in- creases. 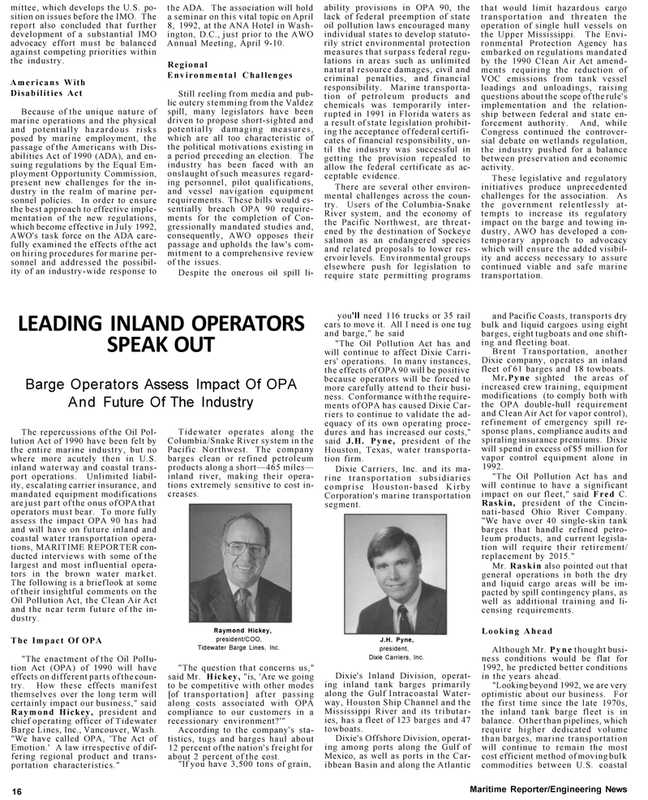 Tidewater Barge Lines, Inc. "The question that concerns us," said Mr. Hickey, "is, 'Are we going to be competitive with other modes [of transportation] after passing along costs associated with OPA compliance to our customers in a recessionary environment?'" Houston, Texas, water transporta- tion firm. Mississippi River and its tributar- ies, has a fleet of 123 barges and 47 towboats. Mexico, as well as ports in the Car- ibbean Basin and along the Atlantic and Pacific Coasts, transports dry bulk and liquid cargoes using eight barges, eight tugboats and one shift- ing and fleeting boat. Dixie company, operates an inland fleet of 61 barges and 18 towboats. Mr.Pyne sighted the areas of increased crew training, equipment modifications (to comply both with the OPA double-hull requirement and Clean Air Act for vapor control), refinement of emergency spill re- sponse plans, compliance audits and spiraling insurance premiums. Dixie will spend in excess of $5 million for vapor control equipment alone in 1992. "The Oil Pollution Act has and will continue to have a significant impact on our fleet," said Fred C.
Raskin, president of the Cincin- nati-based Ohio River Company. "We have over 40 single-skin tank barges that handle refined petro- leum products, and current legisla- tion will require their retirement/ replacement by 2015." Mr. Raskin also pointed out that general operations in both the dry and liquid cargo areas will be im- pacted by spill contingency plans, as well as additional training and li- censing requirements.